The Ace of Pentacles tarot card announces new beginnings and the promise of success in all matters relating to material existence! Woot! Moreover, the Ace of Pentacles also shows how this success is gained. Like a seed, containing all the information it needs to grow into a beautiful flower, fertile crop, or fruit bearing tree, the Ace of Pentacles card outlines the basic principles for a happy and successful life. And like every other seed, this seed of health and prosperity needs loving care to realize its full potential. One of the most important lessons of the Ace of Pentacles tarot card is that life, prosperity, and happiness are divine gifts. They are meant to be accepted and cherished, not renounced. Everyone is entitled to this gift, especially you. More importantly, the Ace of Pentacles includes a “quick start guide” to leading a satisfying and prosperous life. The underlying rules are natural, commonsense, easy to understand, and easy to follow. The secret to happiness and wealth is that there is no secret. The upper portion of the Ace of Pentacles card is dominated by white and yellow. White symbolizes pure spirit and Yellow, spirituality as it can be understood by the human mind. Yellow also most closely resembles gold, representing material success. The hand reaching out of the cloud presents a divine gift, the pentacle. As a coin, it is a well-known sign of wealth. The symbolism of the pentacle explains how this wealth is acquired. A pentacle visually expresses a person’s understanding of the universe. The pentagram with which it is inscribed represents the Four Elements governed by spirit. The lilies in the garden below symbolize sacred devotion. A path leads through an oval gate, reminiscent of the wreath in The World, to higher knowledge, shown here as mountains in the distance. The hedge of roses signifies a moral code will allow you to walk this spiritual path. 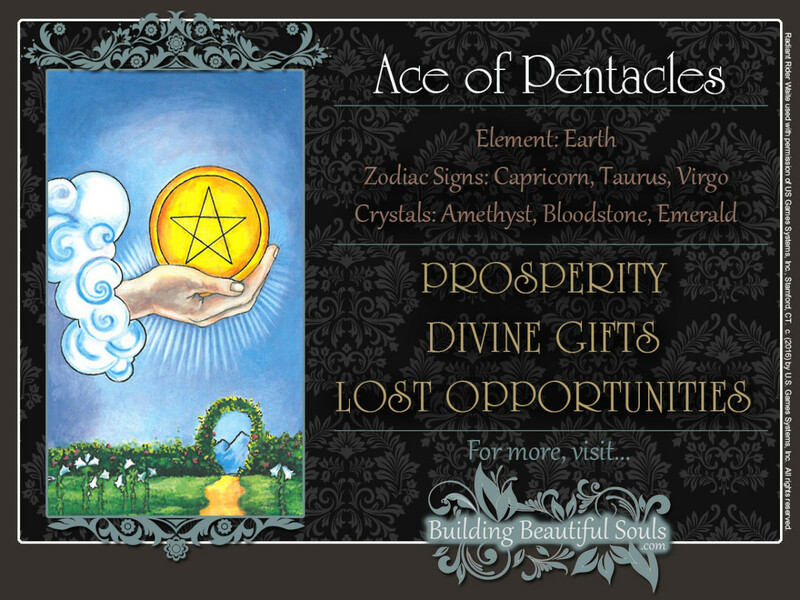 The Ace of Pentacles represents both, a gift and an opportunity. Even better, it is also a set of basic instructions on how to make the most out of this opportunity. While its long term benefits ultimately lead to spiritual fulfillment, the immediate benefits concern your material well-being. After all, it’s pretty tough to focus on abstract ideas, such as your divine purpose and the meaning of life, when you’re drowning in debt. The Ace of Pentacles tarot card suggests that better days are ahead and that the divine source will accomplish this by putting first things first. Noted psychologist Abraham Maslow (1908-1970) first published his groundbreaking Hierarchy of Needs in 1943. He theorized that the needs of human beings range across a spectrum from material security to self-actualization and self-transcendence and that physical needs must be met before other, equally important ones can be pursued. The Ace of Pentacles tarot represents the fulfillment of this most basic need. The material blessing in the Ace of Pentacles tarot card is attached to a value system necessary to preserve it. It’s not easy to learn on an empty stomach, however, and therefore, the Ace of Pentacles gives you the fish and the knowledge of fishing. The Ace of Pentacles tarot card may present an actual gift of money, combined with a commitment to using it wisely. Instead of blowing it on that high-definition plasma TV you’ve been wanting to get for a long time, you’re deciding to pay off some of your debts, or you’re choosing to put it into a savings account. Upright, the Ace of Pentacles tarot card may also announce a new job providing you with enough financial stability to focus your goals on more ambitious pursuits. Perhaps, this new job also offers excellent opportunities for moving up in the company. Your plan for long-term success comes with this job. If you are recovering from an illness, part of your recovery has been adopting a healthier lifestyle that will help prevent you from becoming sick again. When the Ace of Pentacles tarot card presents itself inverted in a tarot reading, it is to remind us that divine gifts are given unconditionally. The challenge is to use them wisely. While the cosmos is generous with its bounty and guidance, the responsibility to make the right decisions is still yours. How are you using that financial windfall, those career opportunities, and that turn of good health? Are you returning to old (self) destructive patterns? Human beings are meant to be happy, but do you have a clear understanding of what happiness really is? When reversed, the Ace of Pentacles tarot card points out an imbalance in the way you are using your resources. Note that when the card is reversed, the pentagram is also inverted. Renowned occultist Eliphas Levi explained that when it is upright, the Four Elements – Earth, Water, Fire, and Air – are governed by Spirit, the divine intelligence. However, when inverted, the other elements overrule its benevolent guidance. Rather than helping you, your material success is actually enabling you to engage in some very unhealthy behaviors. These could include overeating, overspending, binge drinking, and engaging in risky sexual behaviors. Perhaps, your success has gone to your head, and you feel you now have license to terrorize those who depend on you – or you no longer feel any need to express compassion toward others. Continuing on this path will leave you at best feeling empty in the long run. At worst, it can result in your undoing, and the higher you climb, the harder the fall will be. From street gangsters to modern day tyrants, history is full of examples of people who muscled their way to the top of the food chain, only to meet with a terrible end. The lesson here is not self-denial, but remembering that true, lasting happiness is based on enjoying all things in moderation and balance. The Ace is the first card in the Suit of Pentacles. In the Minor Arcana, the Number 1 represents the first impulse or motion of the element of earth. Here, it is the seed or foundation of all things related to material existence and the joy we receive from it.